Please use the form below to report any issues with the historic-style lamp posts that the Trust has installed (an example of these lamp posts is shown to the left). 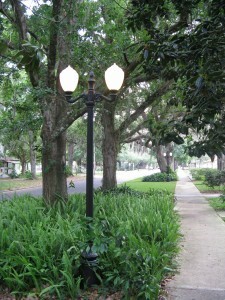 Other style street lights OR those located on City property (including City parks and the roundabout at 9th & Park) are not managed by the Trust. Please contact the City of Sanford regarding any street lights not managed by the Trust. You may also email the trust directly at contact@SanfordhistoricTrust.org.